I slept over at London Zoo and woke to the roar of the lions! WHO KNEW YOU COULD EVEN DO THAT? I didn’t until a couple of weeks ago and from the response i’ve had on social, I don’t think many of you did eith,er? Yep, it’s a real thing. Hop on a tube to Camden Town, walk 15 minutes and it’s all yours. The London Zoo sleepover experience is open to the public and I can now confirm… it’s a very special one. What’s the difference between a normal zoo visit and this overnight experience? Well for starters you get to sleep on site at the zoo in one of the 9 luxury Gir Lion lodges. The lodges are a replica of the huts out in Gir National Park India, a site that ZSL work closely with, and act as your private home for the evening. The concept is simple but absolutely gorgeous. The lodges are equipt with beds (obviously), heating, showers, tea making facilities, complimentary toilettes and towels. 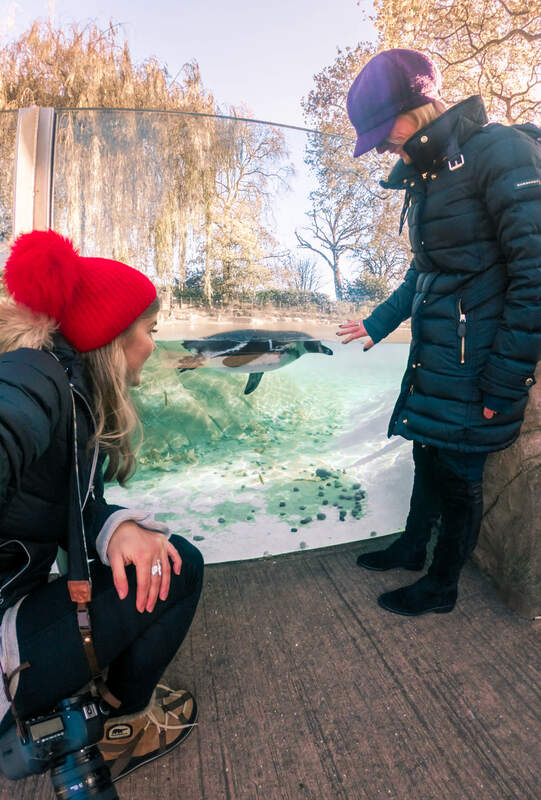 The overnight experience can start as early as the zoo opening time on your day of arrival, allowing you an entire day to explore the zoo before checking into your lodge at 4.30pm. This is when it gets special… REAL SPECIAL. Between 4.30pm and 6.15pm you have time to relax in your lodge or wander through the immediate surroundings (the lodges are located in the heart of the lions). At 6.30pm the incredible zookeepers kit you out with torches and night vision googles and take you on a torchlit tour of the zoo to see who’s awake. Opportunity to feed the animals open up here too! P.s. ZSL shuts to the public at 4pm so from this point you are the only ones in the zoo apart from maintenance and the zookeepers! After discovering the zoo by moonlight and absorbing the fascinating history and operations of ZSL, the zookeepers guide you to a 2 course dinner by candlelight and share their personal experiences. I couldn’t believe the wealth of knowledge the zookeepers shared with us about all the animals. The dinner conversation was almost as good as the food! After dinner and an opportunity to bond with the rest of the group, we grabbed our torches and were led by the zookeepers to uncover the ‘mystery animal’ before heading to our lodges to rest for the night. The following day begins at 8am (unless you wake to the roar of the lions at 5am which was pretty damn special) where you head to the restaurant to enjoy a wonderful breakfast buffet with the group. The magical experience then continues after breakfast as the zookeepers take you around on another 1 hour private guided tour before the zoo reopens to the public. This morning tour included access to the feeding kitchen (which isn’t accessible at all to the public) where you can witness the incredibly particular menus for each of the animals in the zoo. Post morning tour, you are welcome to continue and enjoy access to the zoo as you wish or head to ZSL Whipsnade where you have complimentary access also. Admittedly the lodges aren’t cheap and are around £430 per night (based on two people sharing) but from the above you can see exactly why. It’s an experience like no other and the perfect treat to celebrate a special occasion. Part of the cost of your stay indeed contributes to the incredible work ZSL and their partners do worldwide with the animals. So as well as experiencing a once in a lifetime opportunity – you can also rest easy knowing that you are supporting an incredible charity. Fancy booking YOUR sleepover at London Zoo? See more information and book here!